Week 2 showed that the New York Giants have the will and ability to win late. But looking forward to a Thursday Night Football matchup between the Giants and Panthers after a short week has the reigning Super Bowl champs concerned about recent injuries. Several starters including Ahmad Bradshaw, Prince Amukamara, Hakeem Nicks are out, putting the Giants in a bad way on a short week for the trip to play Cam Newton and the Cats..
Eli Manning and the Giants aerial attack are a big threat against the Carolina defense, remodeled behind first year Defensive Coordinator, Sean McDermott. The Panther defense rattled Drew Brees early and often last week when the Saints visited Charlotte. The Panthers and Giants will square off in what promises to be an offensive gauntlet on the primetime stage on Thursday Night Football. Manning overcame a brutal first half in which he threw three interceptions to finish with 510 yards and three touchdowns Sunday, leading New York to a thrilling 41-34 victory over Tampa Bay. His yardage total was the eighth highest in NFL history, and he passed for 243 in the fourth quarter. “Nobody wants to start 0-2, so it was a big win, especially after the first half playing poorly,” Manning said. Nicks and Victor Cruz had 199 and 179 yards receiving, respectively, as the Giants (1-1) did enough to overcome Manning’s dismal first 30 minutes. The stellar performance also allowed New York to prevail despite another rough day for its secondary, which Josh Freeman victimized for 243 yards and two touchdowns on just 15 completions. Look for Newton, who had a comeback of his own against the Saints, to have a big day against a Giants secondary that needs to start playing better. Newton passed for 253 yards and ran for 71 with two total touchdowns in Carolina’s 35-27 victory over the Saints at home last week. The G-Men also have to watch out for the Panthers run game, as they rolled up 219 yards on the ground after being limited to 10 by the Bucs in Week 1, with DeAngelo Williams and Jonathan Stewart combining for 120 to go with Newton’s 71. Stewart is a game-time decision. All is all, this is a tough matchup for the Giants, who are 2.5 underdogs heading into the contest. Look for a big win for the Cats, as the G-Men fall to 0-2. 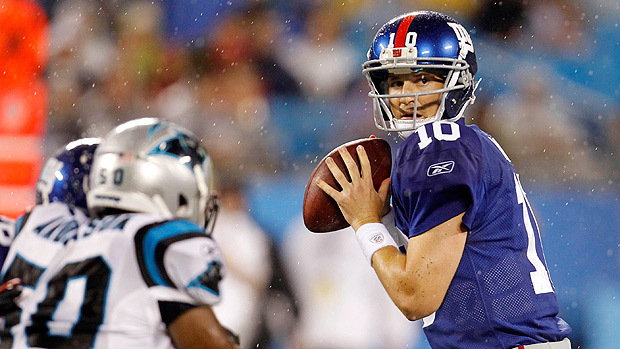 Giants at Panthers – Who Wins the Week Three Battle?